Hello! It’s that time again…time for the holiday rollout at J.Crew! This is one of the rollouts I most look forward to every year – mostly because of cozy sweaters and fun holiday wear (lace, sequins, glitter…I can’t get enough!) This holiday rollout is the first of two for the month of December – the second will be the week of Thanksgiving and I’m told more sweaters and winter wear, which I’m excited about since we’ve only seen so many cold weather items on the last few rollouts. Ok, enough rambling and on to the clothes! 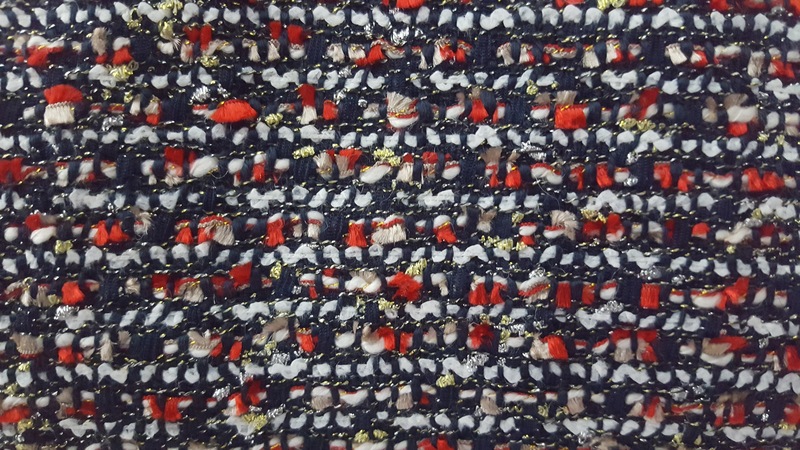 First up, is the Shift dress in multicolored tweed. This was one of the first items I ordered with the rollout and it was included in the 30% off promotion. J.Crew always does a great tweed dress and I liked that this had flecks of red and gold which made it a little more holiday appropriate. Onward to the store…next up is the Lace Dress with Pockets. Shift dresses are usually a disaster on me and this dress was actually a good fit. I’m wearing a size 12 and it’s right above the knees but not so much so that I wasn’t comfortable. This dress also comes in tall and petite. But…the pockets. Why, oh why did we stick four pockets on this dress? I maybe could have handled two on the chest or hips but all four, they seem unnecessary. However, I will say that they don’t add any bulk to the dress so that is helpful and if you like the look, I wouldn’t worry about the pockets making your hips or chest look bigger, they’re placed well. I do like the collar on this dress (which unfortunately I’m blocking to get the right photo) but the pockets are a no for me. Next up, the Pleated Ponte Dress. When I saw this dress online, all I could think of was an ice skating dress. This dress comes in a pine color and vibrant flame (orangey-red) color as well as a heathered grey. The first thing I noticed when I tried on the dress is that it is heavy! It is a thick ponte knit and would be perfect for winter with tights and booties. I sized down to a 10 in this dress – the 12 fit ok but was a little loose in the midsection and chest. 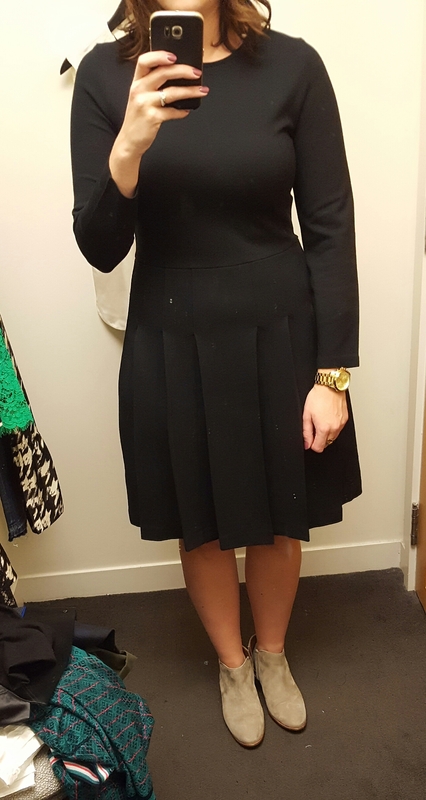 The pleats on this dress are cut very flattering and don’t add any volume to my hips which is usually my worry with pleats. I also like that the zipper in the back is a hidden zipper and not exposed like so many dresses we’ve seen in recent years. This is definitely on my wishlist. I don’t need a black long sleeve dress but I might for the right price. 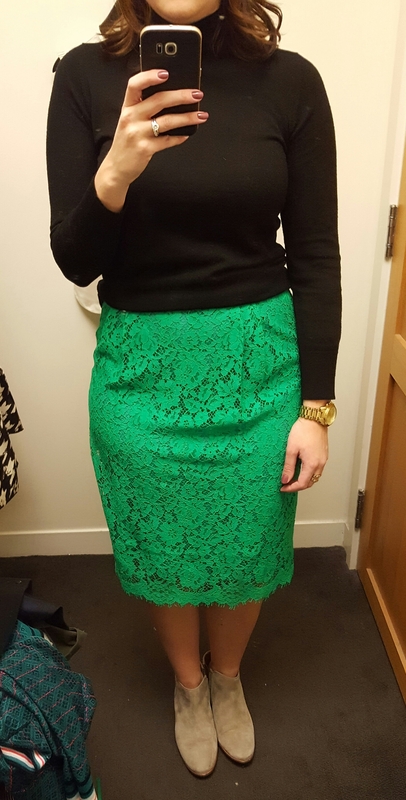 Next up, the Pintucked pencil skirt in lace in Emerald Pool. This skirt also comes in faded teak (beige/ivory) and black. Seeing this skirt online, I was immediately wary of the pintucks. Then seeing it in store, I thought they looked a little less pronounced so was a little more optimistic about this. I also like the bright green added in to the holiday mix this year. I tried a 12 in this skirt. Unfortunately, the pleats in the front aren’t working for me. I liked the length on the regular length, the skirt hits right at my knees. I’d say this runs a tad on the small side since it pulled a bit across my hips. I think it looks nice on the website model so I think if you have a straighter bottom half then this skirt will work and the pintucks could add some visual interest. My store had the lace peplum top paired with the black version of this skirt and it looked so cute. 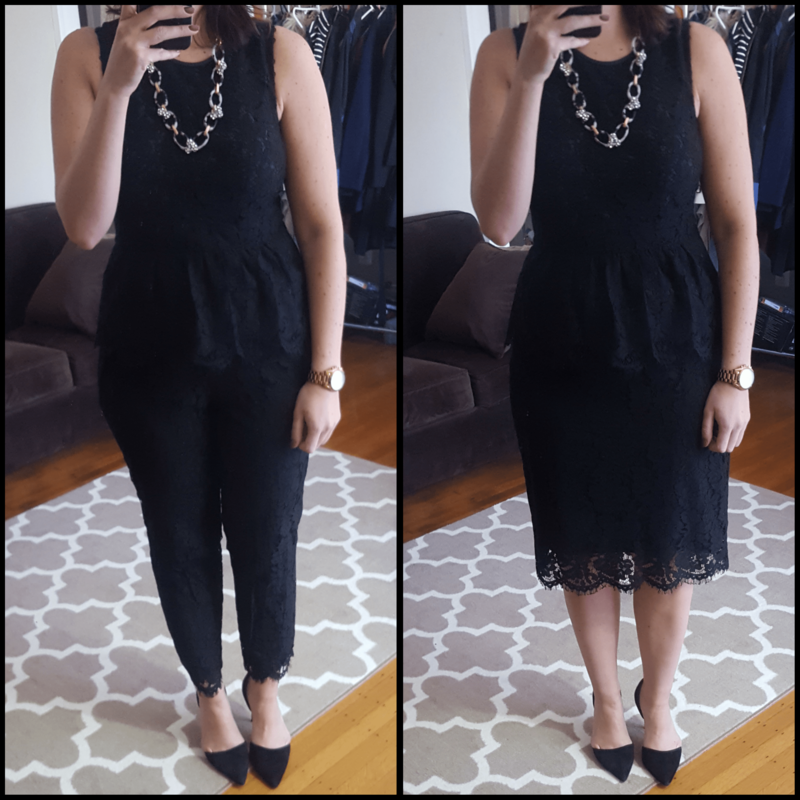 So of course, I went home and tried the Lace Peplum top with my Banana Republic skirt as well as the J.Crew lace pants from last year. Cute and cute! I am wearing a size 10 Tall in the peplum which is perfect. Next up, the Silk Twill Pant in Wolfstooth. Pull on pants can be tricky for me but these were a pleasant surprise. They’re a lighterweight silk twill material and I tried a size 12 in these pants which was a good fit. I like the oversized houndstooth print and I could see these integrating well in my work wardrobe. I had plenty of room in the rear as well, they weren’t pulling at all. I might have liked to see a heavier material in the pants as the silk will be a bit flimsy for a northeastern winter but if you’re in a warmer area these will be fine for you through a milder winter climate. Lastly, the Flounce silk dress in wolfstooth. While the photo of this dress doesn’t look horrible, this dress was a total miss on me. It was really tight in the hips and the ruffle hem hit right below my rear end making it a complete disaster from the back. This dress comes in petite and tall and I could perhaps try the tall length of this dress. I think I’ll be sticking with the pants in this print. This was similar to the paisley dress of the same design that was a complete miss for me. The drop ruffle hem does not work with my figure. I am sure a lot of girls will look cute in this dress, I am not one of them. I am wearing a 12 in this dress. It is the same material as the pants. Well, there’s part one of my dressing room reviews for this latest rollout. I’ll have another one up shortly with a few jackets and more casual tops/sweaters. What are you loving from this rollout? Would love to hear what you think and thanks for visiting!